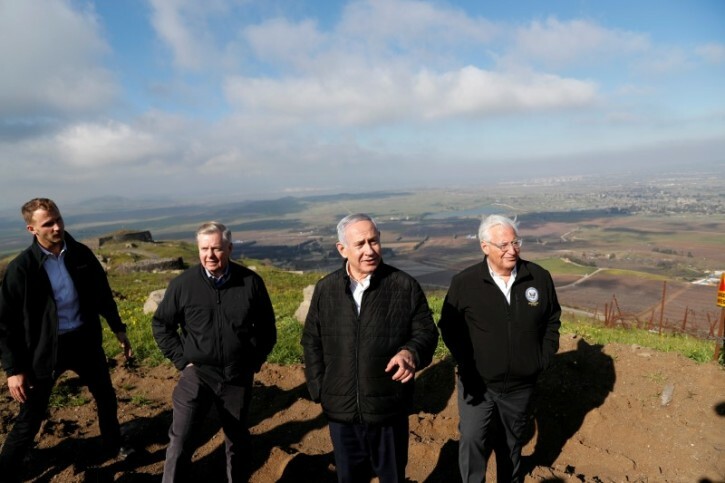 Washington - U.S. President Donald Trump’s call for recognition of Israeli sovereignty over the Golan Heights was manna from heaven for Prime Minister Benjamin Netanyahu two weeks before an election. When was there ever a two-state "solution "? At best, it was a fervent wish and hope - at worst a dangerous delusion. Peace can only ever come with the cessation of hate and ignorance - a task too great for mere men(and women). Pray that the one true SOLUTION, Moshiach, comes peacefully in our times. Only when the world realizes that there is but one H-shem, and that we are ALL His creations , will there be true peace. I hope you know what happened when extremists took fundamentalist positions like yours before the churban Beis Sheini...they too thought they knew the will of the Abishter. It's this kind of reporting by anti-Israel Brit Reuters that causes the long-term risks. It's extremist to take the position of the arabs who want to wipe Israel off the map. Before I even opened the article I knew 'Reuters', has to be, the cursed choleras. Can't stand these MENUVALS, never did, never will.